On my to do list in the data education game is an open-ended activity based on collecting examples of how to do common tasks using a variety of different tools and techniques. One such task is geo-coding, getting latitude and longitude co-ordinates for a location based on it’s address or postcode. 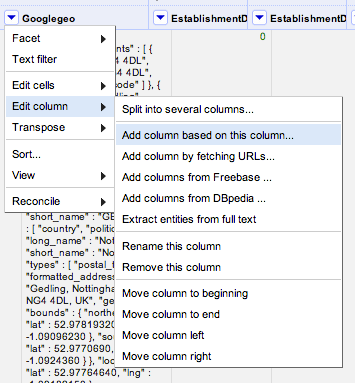 A couple of recent posts on the School of Data blog provide an Introduction to Geocoding and a howto on geocoding in Google spreadsheets. 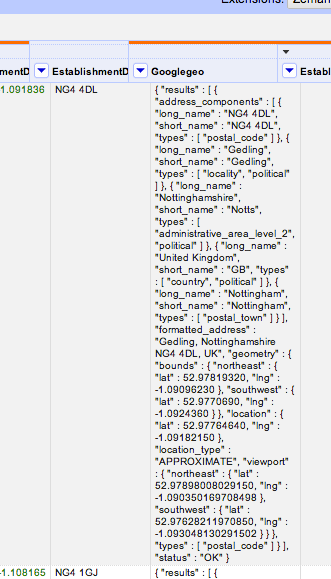 Here’s another approach, geocoding using OpenRefine [download and install OpenRefine] (see also Paul Bradshaw’s related post from a couple of years ago: Getting Full Addresses for Data from an FOI Response (Using APIs)). 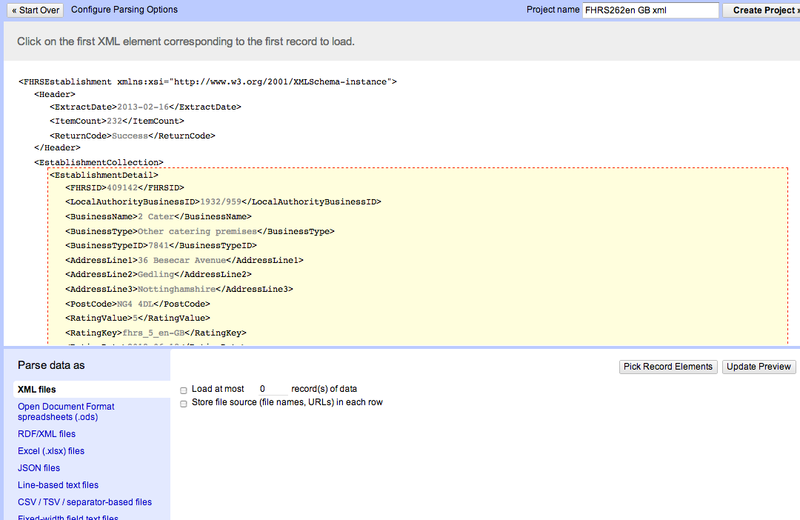 OpenRefine will now download the file and give us a preview. What we need to do now is highlight an example of a record element – OpenRefine will create one row for each such record in the original file. 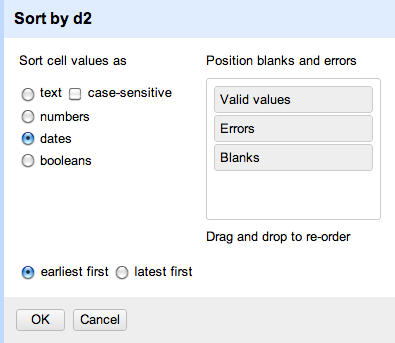 What this does is build up the URL from the value of the cells in the column from which our new column is derived. 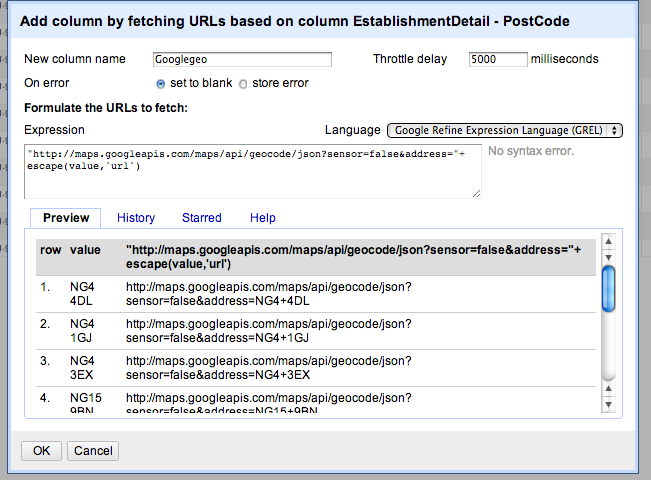 The escape(value,"url") command makes sure that the postcode value is correctly encoded for use in a url. value.parseJson().results[“geometry”][“location”][“lat”] says get the latitude element from within the corresponding location element. 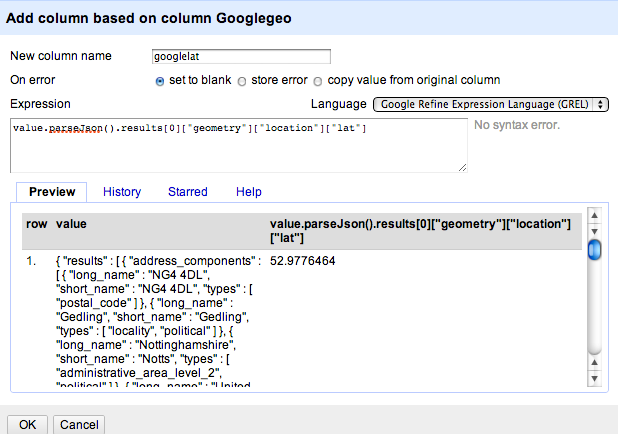 Hopefully you can see how we would be able to create a new column containing the longitude: go back to the Googlegeo column, select Edit column – Add column based on this column for a second time, and construct the appropriate parsing statement (value.parseJson().results[“geometry”][“location”][“lng”]). 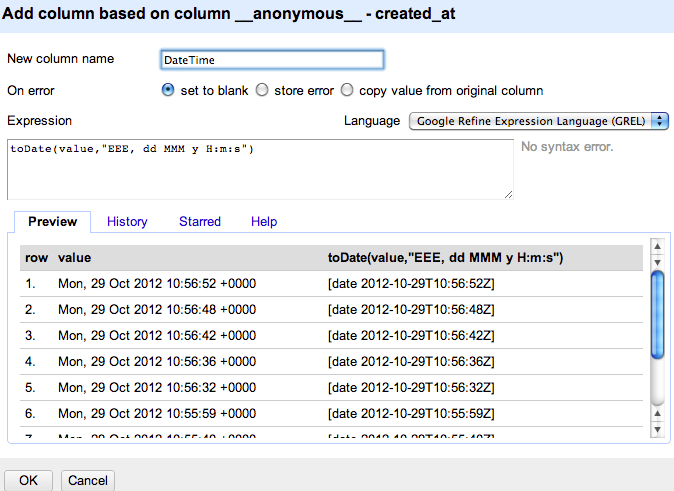 – parsing the data returned from the API to extract a particular data element and adding it to a new column. Suppose you have a dataset containing a list of Twitter updates, and you are looking for tweets that are retweets or modified retweets of the same original tweet. 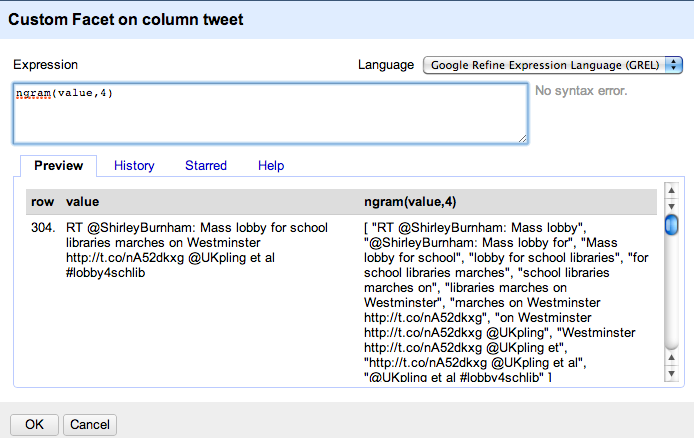 The OpenRefine Duplicate custom facet will identify different row items in that column that are exact duplicates of each other, but what about when they just don’t quite match: for example, an original tweet and it’s appearance in an RT (where the retweet string contains RT and the name of the original sender), or an MT, where the tweet may have been shortened, or an RT of an RT, or an RT with an additional hashtag. 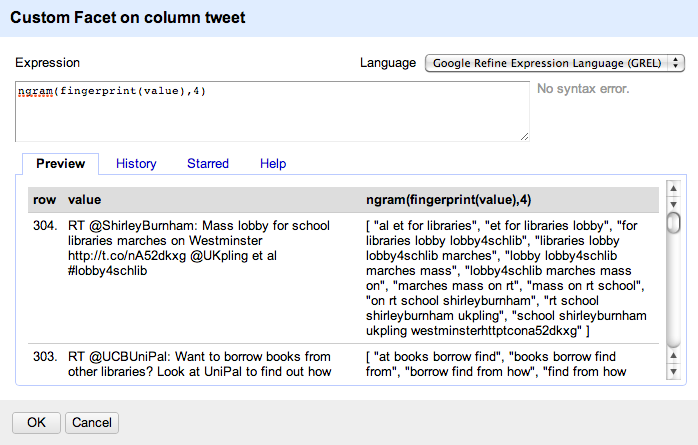 Here’s one strategy for finding similar-ish tweets, such as popular retweets, in the data set using custom text facets in OpenRefine. If we can reasonably expect word sequences of length N to appear in out “duplicate-ish” strings, we can generate a facet on ngrams of that length. 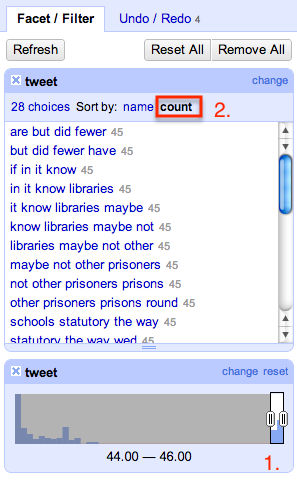 Even if tweets aren’t identical, if they contain common ngrams we can pull them out. 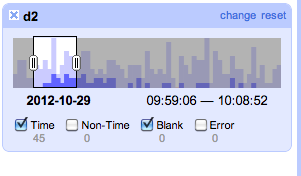 Note that when you set a range in the time facet, you can then click on it and slide it as a range, essentially providing a sliding time window control for viewing records that appear over a given time range/duration. 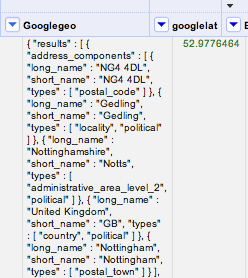 One of the many ways of using Google OpenRefine is as a toolkit for getting a feel for the range of variation contained within a dataset using the various faceting options. In the sense of analysis being a conversation with data, this is a bit like an idle chit-chat/getting to know you phase, as a precursor to a full blown conversation. 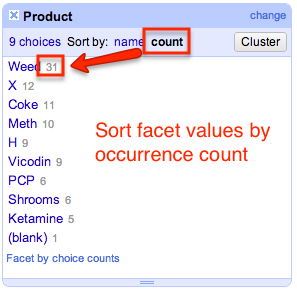 Where the facet relates to a categorical variable – that is, where there is a set of unique values that the facet can take (such as the names of different publishers) – a view of the facet values will show the names of the different publishers extracted from the original search results. Selecting a particular publisher, for example, will then limit the displayed results to just those results associated with that publisher. 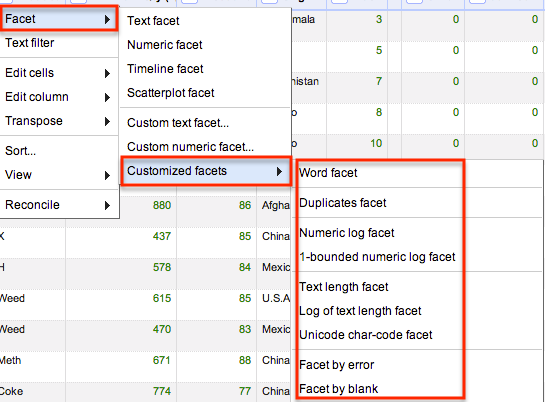 For numerical facets, where the quantities associated with the facet related to a number or date (that is, a set of things that have a numerical range), the facet view will show the full range of values contained within that particular facet. 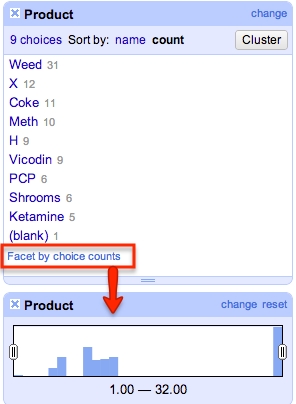 The user can then select a subset of results that fall within a specified part of that range. In the case of Open Refine, facets can be defined on a per column basis. 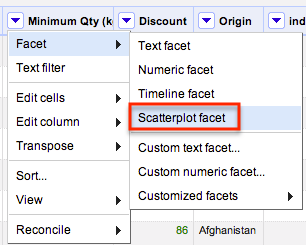 For categorical facets, Refine will identify the set of unique values associated with a particular faceted view that are contained within a column, along with a count of how many times each facet value occurs throughout the column. 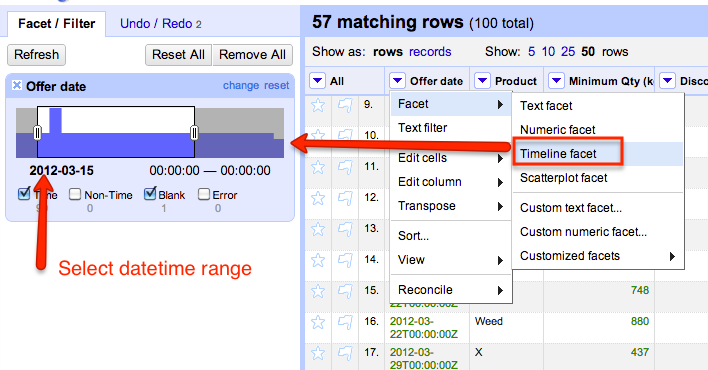 The user can then choose to view only those rows with a particular (facet selected) value in the faceted column. 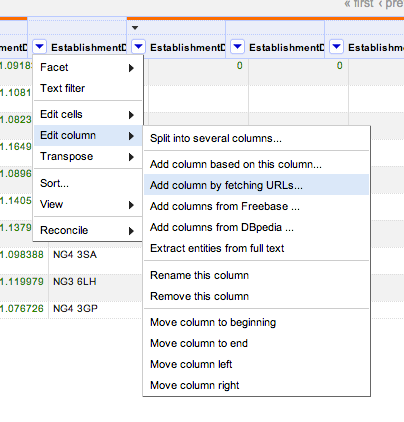 For columns that contain numbers, Refine will generate a numerical facet that spans the range of values contained within the column, along with a histogram that provides a count of occurrences of numbers within small ranges across the full range. 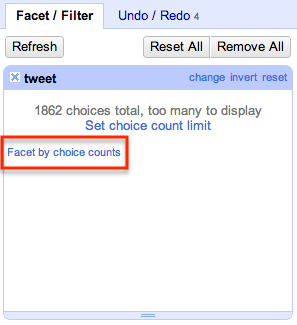 So what faceting options does Google Refine provide? Faceting by time requires time-related strings to be parsed as such; sometimes, Refine needs a little bit of help in interpreting an imported string as a time string. So for example, given a “time” string such as Mon, 29 Oct 2012 10:56:52 +0000 from the Twitter search API, we can use the GREL function toDate(value,"EEE, dd MMM y H:m:s") to create a new column with time-cast elements. 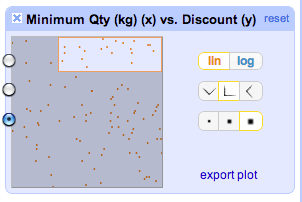 – getting a feel for the correlation of values across numerical columns, and exploring those correlations further, using the scatterplot facet. 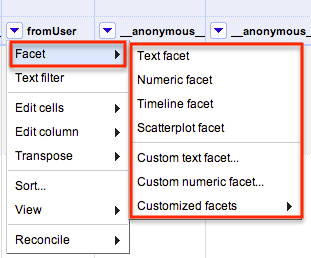 the duplicates facet returns boolean values of true and false; filtering on true values returns all the rows that have duplicated values within a particular column; filtering on false displays all unique rows. Note that facet views can be combined. Selecting multiple rows within a particular facet panel provides a Boolean OR over the selected values (that is, if any of the selected values appear in the column, the corresponding rows will be displayed). To AND conditions, even within the same facet, create a separate facet panel for each ANDed condition. 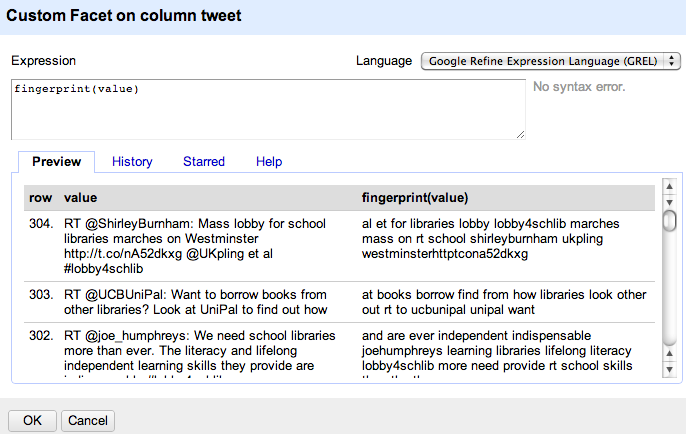 PS On the OpenRefine (was Google Refine) name change, see From Freebase Gridworks to Google Refine and now OpenRefine. The code repository is now on github: OpenRefine Repository. I also notice that openrefine.org/ has been minted and is running a placeholder instance of WordPress. I wonder if it would be worth setting up an aggregator for community posts, a bit like R-Blogger (for example, I have an RStats category feed from this blog that I syndicate to the RBloggers aggregator, and have just created an OpenRefine category that could feed a OpenRefinery aggregator channel). 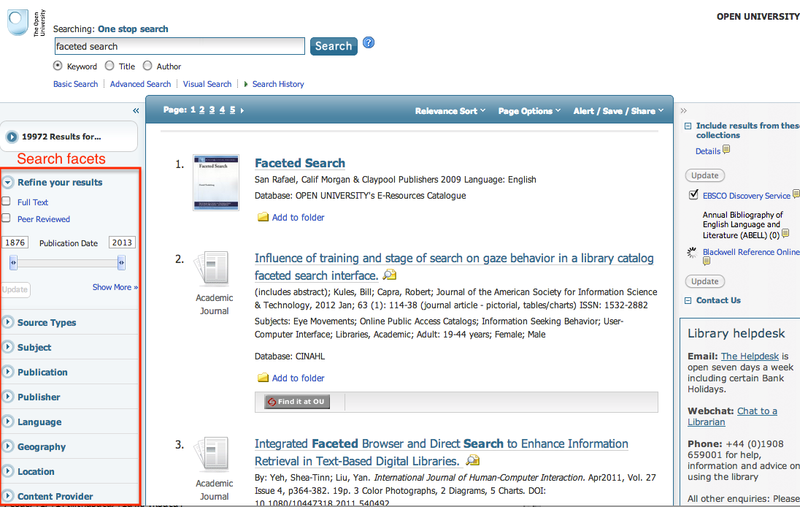 PPS for an example of using OpenRefine to find differences between two recordsets, see Owen Stephens’ Using Open Refine for e-journal data.